Joe McKeown gives direction in the huddle. USA Basketball selected the coach to head its Women’s World University Games team in July. 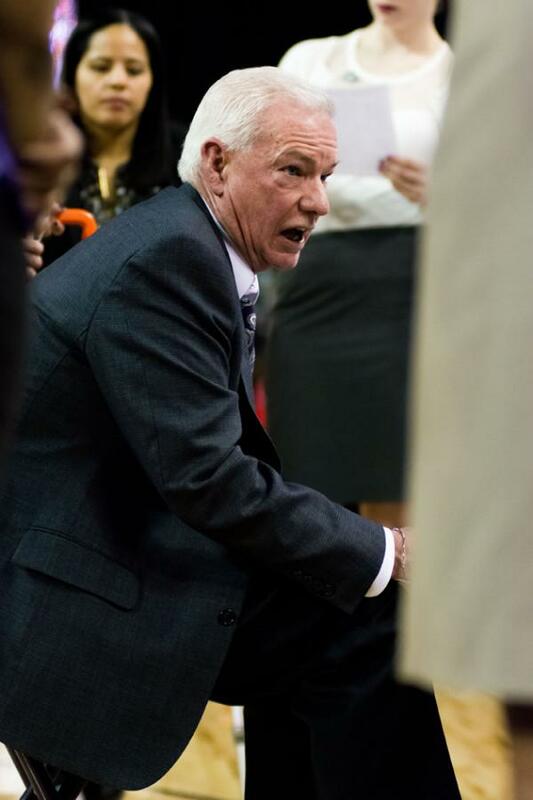 USA Basketball announced Wednesday that Northwestern women’s basketball coach Joe McKeown will head the 2015 USA Basketball Women’s World University Games Team. The selection comes on the heels of McKeown leading the Wildcats to a 23-9 record and NCAA Tournament appearance this season and winning a Women’s Basketball Coaches Association Victory Club award for reaching 600 career wins. The 2015 Women’s World University Games will be held from July 4 to July 13 in Gwangju, South Korea. The competition, organized by the International University Sports Federation, is held every other year. Athletes are eligible to participate if they are between the ages of 17 and 24, are enrolled full-time as a student and have at least one year of college eligibility remaining. Approximately 30 people will be invited to try out for the team two months prior to the competition. McKeown will be joined on the sideline by Holly Warlick, the head coach of Tennessee, and Tanya Warren, the head coach of Northern Iowa.